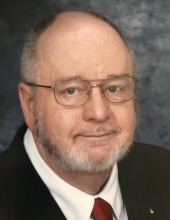 DURHAM: Thomas Vernon Elmore, Sr., 78, passed away on Thursday, January 17, 2019 at Hock Family Pavilion. He was born on September 2, 1940 in Keanansville, NC to the late Blake T. Elmore and Alieen Combs Elmore. Mr. Elmore was a member of McMannen United Methodist Church. He was employed at Duke Medical Center for 35 years as a Medical Technologist. He was a Master Mason and a Shriner. Mr. Elmore is survived by his wife of 56 years, Gayle McClenny Elmore; sons, Thomas Vernon Elmore, Jr., Trent Kevin Elmore (wife, Mary Graham-Elmore); sisters, Linda E. Davis, Cathy E. Westmoreland; and grandchildren, Blake Elmore, Samuel Graham Elmore, Abby Elmore. A funeral service will be held at 3 p.m. on Sunday, January 20th at McMannen United Methodist Church. Burial will follow in the church cemetery. To send flowers or a remembrance gift to the family of Thomas Vernon Elmore, please visit our Tribute Store. "Email Address" would like to share the life celebration of Thomas Vernon Elmore. Click on the "link" to go to share a favorite memory or leave a condolence message for the family.